Last summer, Disney shared the exciting news that Miss Adventure Falls, a new family-style raft attraction, was coming to Disney’s Typhoon Lagoon this spring. With construction is nearly complete Walt Disney World has announced that the attraction will open March 12! 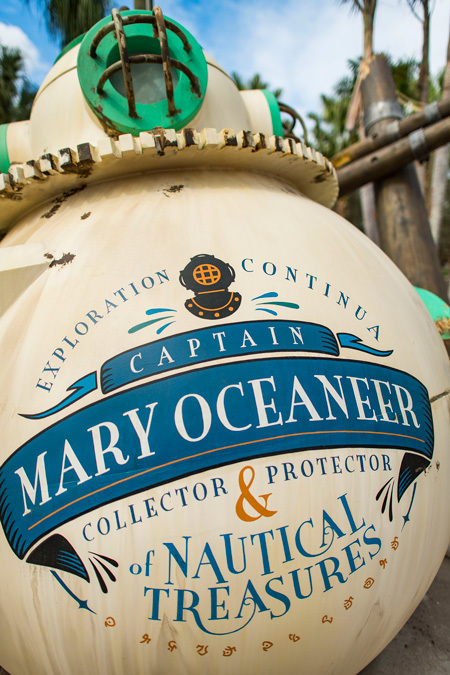 As the final touches to Miss Adventure Falls are being added during the next few weeks, Disney is giving an exclusive first look at some of the unique artifacts collected by Captain Mary Oceaneer – a sea-faring treasure hunter whose haul was caught in a rogue typhoon.